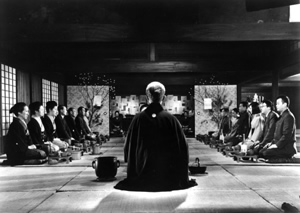 Nagisa Oshima's masterwork, THE CEREMONY was widely hailed as the most ambitious Japanese film of its decade; a dense and complex family saga focusing on a young boy, born in Manchuria, and his mother, who make it back home after the war to rejoin the powerful Sakadura clan. Oshima savagely chronicles the family's fortunes and woes from 1946 to the present, as its members gather for yearly ceremonies: burials, weddings, reunions. Through magisterial use of flashbacks, Oshima reveals the Sakaduras' dark past, its communists and militarists, war criminals and rising businessmen, sports heroes and suicidal patriarchs all involved in postwar Japan's economic rise and societal shame.